Did you know that tractors used to be fitted with steel tires – and what a problem that caused for America’s growing small towns? Hoyle Pounds is one of Winter Garden’s “Citizen Heroes.” While successful in agriculture, he was more than just a citrus grower. The many business enterprises he operated in Ocoee and Winter Garden afforded him the opportunity to improve existing farm equipment as well as invent new devices to aid in local agriculture. 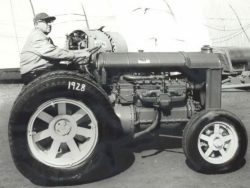 One of his patents involved the use of rubber tires on tractors originally fitted with steel tires that destroyed brick and asphalt roads as they drove from grove to grove. After parts were shipped to Winter Garden by train, tractors were assembled in a large building Pounds constructed on Plant Street in 1926. He also found time to serve as the chief of Winter Garden’s volunteer fire department – for over forty years! The exhibit features material from our Hoyle Pounds Collection.